We are seeing the photos and the front pages of the newspapers, the first dispatches from reporters, Eisenhower’s correspondence, and today’s observance in Normandy. Seventy years ago today, the war in Europe turned. 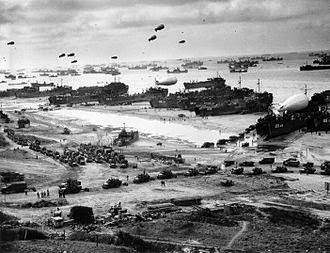 The landing of the allies and their establishing a beachhead was the first step that clearly went in the direction of defeating Hitler. Seventy years is a long time. I like to try to get perspective on what younger people are thinking today by thinking about the times I was that age. When I was in college, seventy years ago was before either of the world wars, and it seemed like another world. It was, just as D-Day must be for today’s college students. And, indeed, for all of us. It’s hard, in today’s relative peace, to imagine the necessity for a coordinated air and sea assault involving hundreds of thousands of people. It’s hard to imagine a leader of a European, or any other country, deciding to conquer a continent. And almost succeeding. On June 6, 1944, we didn’t know how long it would take to beat Hitler back. And there was a war in the Pacific against Japan as well. It would be another year and more before the war was ended. Thinking about the immediacy of the invasion of the beaches, the shooting and death, the paratroopers landing can blot out that bigger picture. We must think of the people involved, but D-Day was also the hinge point between an older world where military conquest made a nation strong and a newer world in which that sort of aggression would be unacceptable as a means of state-building. Photo – Landing supplies at Normandy.